Subtle sweet taste. Source of protein. + calcium & vit. B2, B12, D. 100% plant-based. Nutritious and a source of high-quality soya protein, which contributes to muscle maintenance. Easy to digest as naturally lactose free. Naturally low in saturated fat. Free from dairy, gluten and wheat. Proterra certified - sustainability non-GMO soya. Free from colours and preservatives. Suitable for vegans.Where does plant power come from? 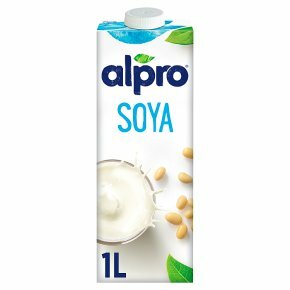 The plant based goodness of Alpro®Soya Original is our carefully selected blend of superior grade soya beans which we mill to create a true Original, our first step on the voyage of soya discovery. Best served chilled Can be introduced as part of a healthy balanced diet from 6 months of age. Suitable as main milk alternative from 2 years.